24/7 Rapid Response and Removal | Call Today! The Bee Hunter Specializes Solely in the Control & Removal of BEES, HORNETS, WASPS, AND YELLOW JACKETS! Thank you for 12 STRAIGHT years of Angie’s List Super Service Awards! The Bee Hunter has a greater number of positive reviews on Angie's List than any one of his direct competitors. In fact, he has more than all of them combined! There's a reason for this. Call today and find out why. Do you have a bee problem? Are you trying to find out how to get rid of bees, wasps, hornets, or yellow jackets? 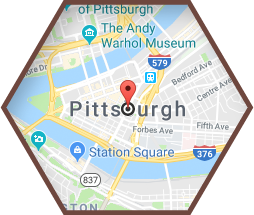 The Bee Hunter is a bee removal and wasp control company locally owned and operated, specializing in the removal and prevention of Bees, Hornets, Wasps, and Yellow Jackets, and other stinging insects in Pittsburgh, PA and Southwestern Pennsylvania. The Bee Hunter removes yellow jacket nests, bee hives, wasp nests, and hornet nests with a specialized Rapid Response and Removal Treatment that kills stinging insects instantly. 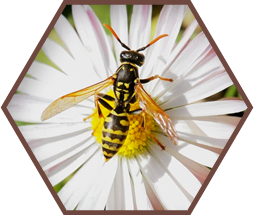 The stinging insect extermination processes can be done at any time of day or night, and treatment typically takes only one or two hours to complete. The Bee Hunter is fully licensed, certified, and insured. Plus, his work is warranted in writing. If you are looking for a Pittsburgh Bee Removal Service that specializes ONLY in the control and removal of stinging insects such as Bees, Wasps, Hornets, & Yellow Jackets, then you've come to the right place. Contact The Bee Hunter today - Get Rid of Bees! To identify the stinging insect troubling you, please visit my Types of Bees page and give me a call at 412-965-2448. I am available 24 hours a day, seven days a week. Please see the full list of Bee Removal Services to find out what I can do for you, or read the Bee Information page, which answers common questions about bee removal and wasp control services in Pittsburgh and Southwestern, PA.
Read the many reviews written by The Bee Hunter's satisfied customers — or submit a review your own. Jim was totally booked solid but he took the time to have a nice conversation with me about tips and suggestions for me going forward. I appreciated his time very much. Stand up guy! Originally posted on Google Reviews. Great service. He called multiple times to let us know when he would arrive. Finished the job the day I requested service. Yellow jackets are gone! Jim the Bee Hunter is amazing! I called him after I saw what I thought were yellow jackets hanging out near my roof. When I called, I thought I'd have to wait to get an appointment. Not at all! He came over within a few hours... He was very nice and professional, and he took the time to do the job well. I highly recommend him (and I'd give him 6 stars if I could!). Very professional and knowledgeable !! Came a day earlier than he said he would be able too. I highly recommend this gentlemen if yinz have a wasp/yellowjacket, bee or hornet problem! View photos and descriptions of different types of stinging insects. This information will help The Bee Hunter better assist you when you call. 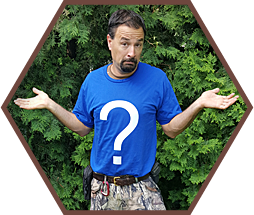 A comprehensive list of questions and answers that The Bee Hunter is often asked about bees and how to control them. The Bee Hunter services every town, neighborhood, burgh, and borough from Zelienople to Venetia. Professional and friendly. Answered his phone immediately and came to my house within two hours. Took care of my situation in less than a half hour. Extremely satisfied!! Karen L., Pittsburgh, PA | Originally posted on Yelp. This man is the ultimate professional. We thought the yellow jackets were under our siding, but Jim came inside and found the nest by feeling the warmth through the ceiling. He [removed the yellow jackets], cleaned the area and told us it would take a few days for them to be completely gone. Not only is he a professional, he is very personable. His insecticides are safe for pets. We will have him back in the spring for preventive spraying. Chris G., Kettering, OH | Originally posted on Yelp. We emailed Jim at 8pm on a Saturday and received a phone call back in minutes. Jim came out the next day (today - Sunday before Labor Day!) and was here exactly when he said he'd be here. He was professional, very knowledgeable, and got the job done within 40 minutes. Price was entirely reasonable - especially for removing thousands of bees on a holiday weekend in ninety-degree weather! Ashley W., Pittsburgh, PA | Originally posted on Yelp. Prompt and professional. Extremely knowledgable and experienced. Quick to respond and solve our problem. Victoria G., Pittsburgh, PA | Originally posted on Yelp. Kevin C., Pittsburgh, PA | Originally posted on Google Reviews. Contact The Bee Hunter Today!